Browse all original artworks and their meanings. Click on any artwork that speaks to you in order to view available printing options. Metamorphosis from the ugly duckling into the beautiful, graceful swan. The sacred geometrical shape of the “vesica pisces” in the center represents the energy completion of reciprocal male/female energies creating a perfect balance together flowing naturally, suspended in universal matter. Love is just as the title suggests. This is how I feel when I am surrounded by love and feel love. It's blissful, wistful, ethereal, heavenly, beautiful, uplifting and encourages you to greater heights. If you look closely enough, you can see a heart in the image. There is an aspect of duality and merging multiple perspectives to find a unique one that fits with her own that is undefined and refuses to blindly follow another just for the sake of not being alone. She is pregnant with the heart, of life, of the earth, of the new, of the potential of creation showcased by the orange. She is birthing a new expression between her spiritual self and the self that she expresses in the external without censorship. You wander to the left; you wander to the right, to the dark, to the light and then back again. Where will you stop and take a breath, will you ever see the beauty in your present? See the black, the pain ~ utilize the gift of knowledge it offers and then forgive and release – let it go to find yourself free. Represents two bodies hurling upwards toward each other surrounded by atmospheric creative energy. This is my personal favorite piece that I am unable to part with. It reminds me every day to keep moving forward, trusting that everything around me is in its rightful place. Click to view print options available. A woman is free floating in her unique expression. This piece is about honoring yourself, how you really feel, stepping into the elation of life that surrounds you and is waiting for you once you finally embrace the authenticity of your uniqueness. Everything is but the perception in which we choose to see. Life can be beautiful or life can be painful, it really is your choice. The black lines subtly behind the enlivened colors represents chains: chains that can bind you and keep you down, feeling trapped by circumstance, person, place, emotion – whatever the illusioned imprisonment may be. 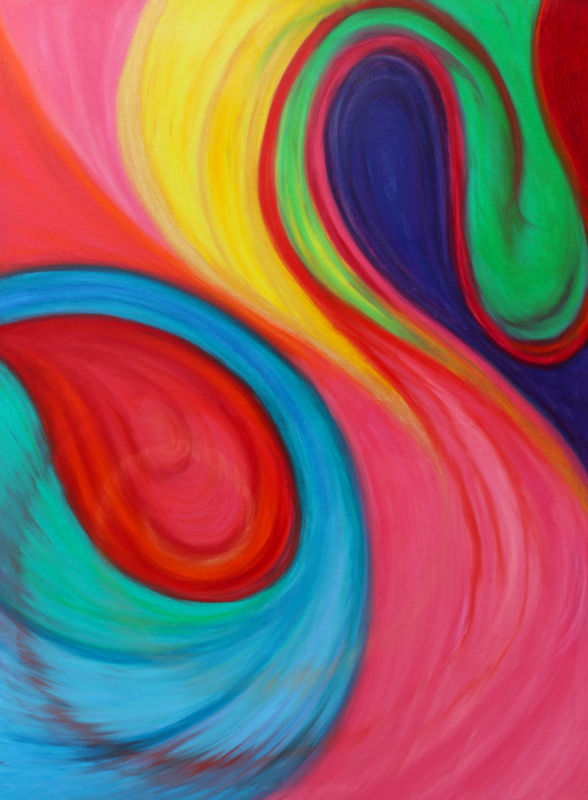 The swirling colors represent the beauty and possibilities that are floating and emerging for anyone to see when they choose to move beyond limitations. The inner explosion, shedding light in the dark of the inner shadow that clouds the truth. Fractions of inner beauty begin to see the light of day. Plunging into the pit of your stomach, finding all that resides that tried to remain hidden. A trail to help lead the way as soothing water rushes in to begin the cleansing cycle. The seer in the center of the chaos that is creative energy that manifests into reality, drawing intentions and thoughts from the captain in the center ~ you. You are The Chief of your life experience and are able to create all the potentials you can imagine. Your higher self and your physical self are working in tandem to bring forth all the dreams that float like ripples through existence. When you let go of the pain and attachment of a hindering circumstance the freedom of release and lightness brings so much joy. There was a girl whose heart was light and mind full of fantasy. She traveled long and far on the wish of a star, not knowing what was waiting for her. She longed to love and live free in the open breeze, and she did this for awhile at the delight of all creation, until one day. Along came a man who showed her love and beauties, deceiving every corner she ventured around. He wrapped himself around her tight and she loved his velvet warmth. In her mind she was free and lived in love. She soon began to wonder if there were others, for all he allowed her to see was him. Behind all of those corners he had caged her in mirrors and illusions. He found delight in keeping her in his cage, all to himself. 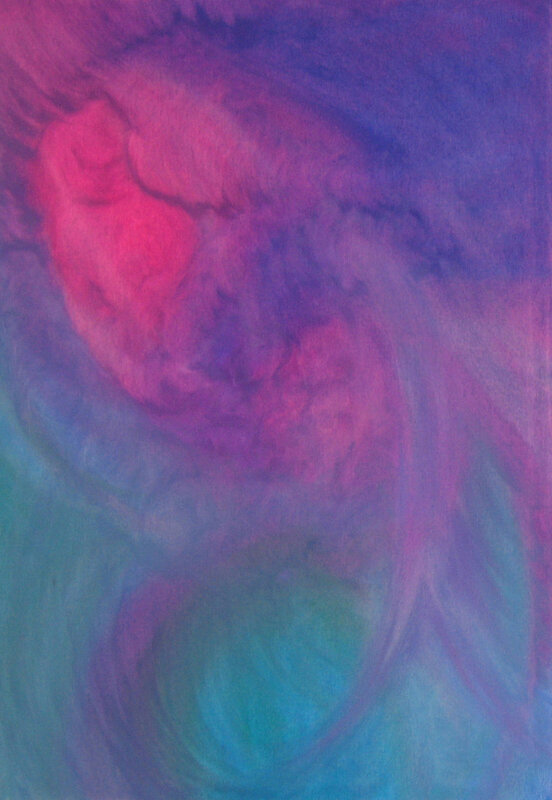 Emerging through turmoil to find the unconditional love buried in the center of your soul. Shinning ever brighter after the storm has cleared and ready to illuminate the surrounding colors that make you unique. Self is an abstract expression of how we can feel about our internal state during specific moments in our life. Feeling the calm of knowing, indicated by the blue at the bottom. 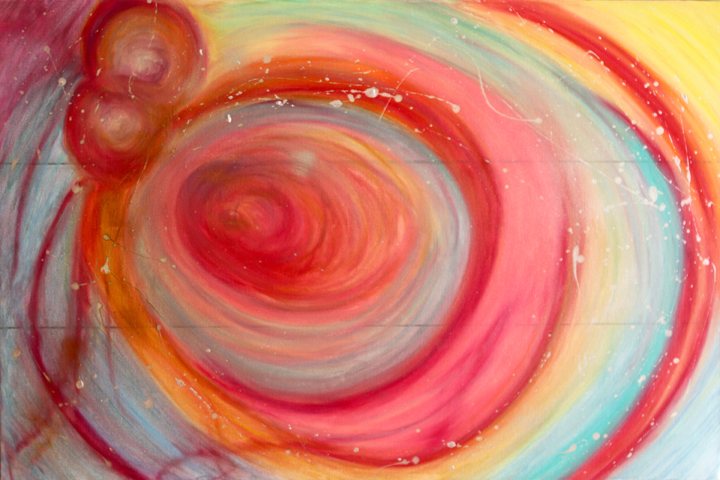 Spiraling up our core through our body and the chaos that fills our minds. We like to see things as we choose, instead of what they really are. This painting symbolizes the unearthing of the dark reality that is life and yet shows there is beauty at the same time. As with any transformation, there comes a point where you begin to feel comfortable in the newness. Subconscious depths of the soul raging to stir awareness in the conscious mind. WAKE UP! Either sink or swim. What is stirring inside of you begging to be let out? Male and female perceptions colliding in the center as they struggle to understand each other. Birth is new beginnings being brought through the root and sacral chakra points. The arrival home to the calm, soft, gentle waters of your subconscious soul after a hard clearing cycle has subsided. Floating ever so gently along the river, basking in the light of the warm sun. Aurora was created as a live painting performance piece at Downtown Los Angeles Artwalk in 2008. The many people that watched the creation of this are a part of this painting. A coming together of energies to create something new.